A Wide Gulf Persists Between Black And White Perceptions Of Policing : The Two-Way According to a new study, only a third of blacks and nearly three-quarters of whites say police in their communities do an excellent or good job using appropriate force. 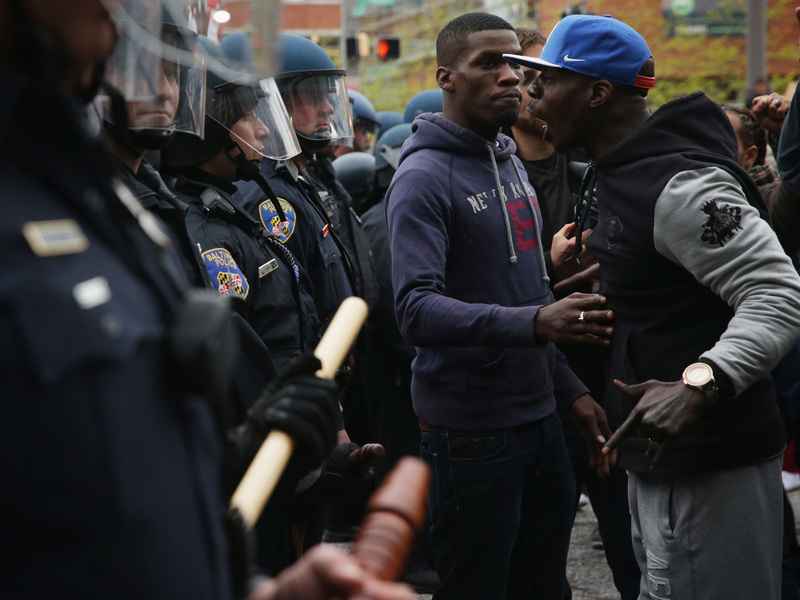 Protesters clash with police in Baltimore on Apr. 25, 2015, during a march in honor of Freddie Gray, who had died in police custody on Apr. 12. A new study highlights differences between the races as they view the recent spate of deadly encounters between blacks and law enforcement. A survey by the Pew Research Center finds only a third of blacks and nearly three-quarters of whites say police in their communities do an excellent or good job using appropriate force. "Most whites (75%) say their local police do an excellent or good job when it comes to using the right amount of force for each situation. Only 33% of blacks share this view; 63% say the police do only a fair or poor job in this area. About six-in-ten Hispanics (62%) say their community's police are doing at least a good job in this area, while 35% say they are doing only a fair or poor job. When it comes to treating racial or ethnic groups equally, 35% of blacks say the police department in their community does an excellent or good job, compared with 75% of whites. Conversely, about a quarter (23%) of blacks say their police department does only a fair job and about four-in-ten (38%) say they do a poor job. (Among whites, about a quarter – 24% – say their department does only a fair job or a poor job in treating racial and ethnic groups equally.) Roughly six-in-ten Hispanics (58%) say their local police are doing an excellent or good job in this area, while 38% say they are doing only a fair or poor job." The two races come to different conclusions about the reason for fatal incidents. About 8-in-10 blacks (79 percent) say the recent deaths are a sign of systemic problems between police and the black community, compared to 54 percent of whites. The survey was conducted online and by mail with 4,538 U.S. adults between Aug. 16 and Sept. 12. The poll came before protests of a Sept. 16 shooting in Tulsa, Okla., as well as the fatal shooting of a black man in Charlotte, N.C. That shooting on Sept. 20 set off two nights of protests. There are areas of agreement. Regardless of race, many Americans say the public protests of the shootings of blacks are motivated by long-standing anti-police bias as well as by a genuine desire to hold police accountable for their actions. Overall, about two-thirds of the public (63 percent) say the protesters are driven by a genuine desire to hold officers accountable. Both groups favor the use of body cameras by police to record encounters when dealing with the public. Overall, only about a third of all those surveyed have a "lot of confidence" in their own police department.